This week, TheCityFix is live from Mexico City for the tenth International Congress on Sustainable Transport (“X Congreso”). Join us as we explore answers to the question of how to reinvent people-oriented cities. Photo by Justin Swan/Flickr. How can we make cities better places to live? This central question is at the heart of countless efforts from governments, civil society, and individual citizens to transform and reinvent their cities. Given the rapid scale and pace of global urbanization—urban areas add 1.3 million people each week—tapping into the innovation necessary to make these solutions a reality is key to improving quality of life for billions. This week, TheCityFix is coming to you live from Mexico City, where EMBARQ Mexico is hosting the tenth annual International Congress on Sustainable Transport (“X Congreso”). With the theme of “Reinventing Cities,” the conference takes an ambitious look at what can be done to shape livable, sustainable cities and megacities—places where millions of people not only live, but thrive. If you can’t join us in Mexico City, follow #X_CITS, @X_CITS, @EMBARQMx, and @EMBARQNetwork on social media and watch the keynote sessions streaming live. But before diving in, read more about some of the key themes and discussions to look for throughout the week. Our cities are changing, and the way we plan and move around in them is changing, too. Specifically, the emergence of the modern megalopolis—which geographer Jean Gottman first used to describe the economically connected region spanning from Boston to Washington, D.C. in the United States—presents new challenges for integrated, sustainable urban planning and mobility. It’s no longer enough to think at the scale of the city, instead leaders must begin thinking at the scale of the metropolitan region. Contemporary megalopolis regions like China’s Pearl River Delta (whose 11 cities include Shenzen, Hong Kong, and Guangzhou) are reshaping the way we think of urban economies and governance in an increasingly globalized world. This shift in thinking demands a parallel shift in planning practices, something cities must embark on together to find solutions at scale. How can we unlock the finance to build the cities we want? If you read TheCityFix regularly, you’re probably familiar with at least a few of the innovative ideas already out there to make cities better places to live. Some may be more practical—like leveraging existing technologies for smarter cities or creating more pedestrian-friendly streets—and some are more far-reaching, like floating cycle paths or personal rapid transit. Whether immediately doable or wildly outlandish, there is no shortage of ideas for urban transformation. Financing these visions and making them a reality has proved more challenging, even in developed economies. Adding to this challenge is the tendency for financial flows to follow business as usual patterns, particularly in the transport sector. Experts and citizens alike are coalescing around a shared vision for creating the cities we want. The discussion is turning to how to unlock the finance and build the capacity in cities governments to make it happen. While Congreso addresses issues relevant to cities across the globe, lessons from the history of host Mexico City shouldn’t be overlooked. Long governed by policies that encouraged urban sprawl, the city has recently taken aggressive measures to become more sustainable, livable, and connected. Its new mobility law is among the most transformative in the world for prioritizing pedestrians and cyclists, an effort the city government also supports with robust active transport systems and infrastructure. The city is also the center of national efforts at urban reform that aim to reverse the patterns of sprawl gripping cities across Mexico. Underpinning all of these is one of the largest and most established bus rapid transit (BRT) systems worldwide, Metrobús, which proudly boasts that each of its buses has the capacity to eliminate the need for 126 cars on the road every day. The private sector is also contributing to Mexico City’s sustainable mobility rebirth, with startups like Carrot bringing car-sharing to the city. 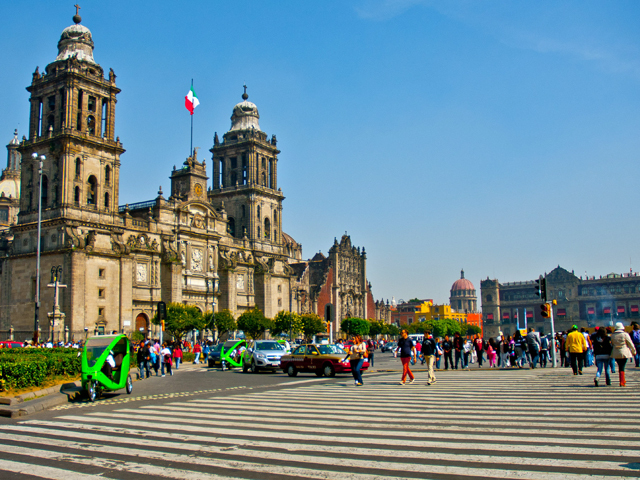 As the second largest city in the world, Mexico City faces a number of challenges in providing sustainable mobility to its growing population. But its emerging successes serve as a reminder that reinventing a city, while not possible overnight, is achievable with long-term vision and a commitment to citizens’ needs. This people-oriented approach is one that can be adopted worldwide to make cities better places to live for all. Follow X Congreso online at #X_CITS, @X_CITS, @EMBARQMx, and @EMBARQNetwork on social media and watch the keynote sessions streaming live from Mexico City’s World Trade Center.